Following is an article that appeared in the Monroe Democrat, Vol. 78 - 1909. The small village of Brodheadsville was thrown into a fervor of excitement, which finally developed into the most profound sadness, when between the hours of four and five o'clock Wednesday, the news was heralded through the village that Albert T. Kocher and Miss Edith Frantz, aged about 19 and 17 years, respectively, had been drowned in Lake Mineola and that the third young lady, Miss Anna Shupp, was still in the water almost dead. The accident occurred while the young people were pleasure driving and had driven to the East end of the lake to water the horse. All three of the young people were students at the Fair View Academy, a school at Brodheadsville. Albert T. Kocher was the son of Thomas Kocher, proprietor of Ross Common Hotel and it was his custom to drive to school daily, and he kept his horse at the residence of the Serfass family, who lived no great distance from the school. He also decided he would board there for the remainder of the term. At the close of the session of school yesterday he hooked up his horse and prepared for the homeward journey. When coming to the house he found that all the family had gone out and that the house was locked. The small boy of the house who had the key had not yet returned from school. He was about to give his horse water, but the place of watering was a pump, and in order to start this, he would have to get some water to start the suction. Thinking that the boy would soon return from school with the key he asked the young ladies named to take a ride with him about the lake, which would mean a drive of probably about a mile. It was on coming to the lake on the East side that he decided to give the horse a drink by driving him into the water. In order to reach the lake at this particular place a small hill must he descend. On going down this hill the carriage ran on to the horse, which was a light build, and scared the animal so that it plunged into the lake. Miss Anna Shupp, daughter of Mr. and Mrs. Milton Shupp, of Effort, who is the surviving member of the party of three, when interviewed at an early hour Thursday by a Times representative, in broken and sorrowful voice related the particulars of the accident as best she could, she being still under the doctor's care and having passed a restless night as the result of the fright and the long expose to which she was subjected. "I can't say exactly what did happen after the horse started," she said, "but after we had gone about twenty or twenty-five feet in the water we suddenly came to a much greater depth, and then all three of us floated from the wagon and the horse was submerged." They had driven off a ledge and the horse, carriage and occupants were precipitated into water about seven or eight feet deep. What happened for a time after this is hard to tell, as the sole survivor of the three is the only one who knows anything of the particulars of the accident, because it was seen by no other person.She had gone under the water for the second time, and it was on coming up that she floated on the carriage which still was in an upright position. She quickly realized that this was her only chance for life and at once seized hold of the wagon. She was standing in the back of it, holding on the seat, when, looking around, she saw the body of Kocher floating on the water as it was about going down for the last time. She also saw the body of her girl chum although she did not recognize it at first, as she was standing in the water up to her shoulders, in which situation she remained until twenty-five minutes later, when she was rescued all but dead. "I thought at first that we would drown," Miss Shupp said, "because of the fact that not one of the three of us could swim." In this position, in the water to her shoulders and very nearly overcome by what she had already passed through, she began to think of means whereby she might be saved. She had frequently called for help and was all but exhausted, when the needed help came. Mrs. Emma, wife of Luther Marsh, of Brodheadsville, was at this time passing the place with the cows and on nearing the cries she at once started to investigate. On coming near the lake she discovered the trouble and then ran across a field through which Freeman Shiffer was passing. Mr. Shiffer at once started for the village in order that he might obtain help. In the meantime Mrs. Marsh went in great haste to the south side of the lake to the boat landing and tried to loosen a boat. To her terror she found that every boat at. This place was locked and that there were no keys at the place to unlock them. She seized a stone and before long had broken one of the locks, and jumping into the boat, started to the rescue. She had gone about ten feet from the shore when she was hailed by John Schoch, who had come back from the village in company with Mr. Shiffer. She returned to the shore, and Schoch, leaping into the boat, seized the oars and rowed rapidly to the rescue. He at first secured the body of Miss Frantz which was still floating and then went to the Shupp girl, whose strength would only have lasted a few minutes more. Standing in the boat, Schoch grasped her under the arms and lifted her into the boat. Although so stiff that she could not bend she grasped him by the arm with such a grip that blue marks are the result. The girl was taken to the shore, where she was seized and shaken by those gathered. After being exercised she was told to proceed to the village as quickly as possible in order that serious results might be avoided from the long exposure to the cold and water. She, in company with Mrs. Marsh, took a field path to the home of the latter's parents, Mr. and Mrs. William Serfass. It was here that she was given stimulants and medicine to bring her out of danger. She rested comfortably during the night, considering the circumstances, and was able to speak to the Times man Thursday when he called at the Serfass home. Although weak, when told that the press representative was in the house, she came from her room in order that she might tell her own authentic story of the accident. She was taken to her Effort home today. As stated by her, she was tempted to jump in the water because of the terrible surroundings, but realizing that she could not swim and that intense exposure had caused her to become very stiff, this idea was not carried out. The body of Miss Frantz was placed on the shore and artificial respiration and other means of resuscitation employed before the arrival of Dr. Trexler, who had been summoned. All water had been removed from her lungs yet the doctor at once pronounced her dead. Her body was conveyed in Dr. Trexler's automobile to her late home. Although one life had been saved and one body recovered, that of Kocher could not be found. It was now growing dark and no traces of the boy were to be seen. At once lights and a number of boats were secured and search for the body began. It was a little before 10 o'clock that it was pulled to the surface of the water by the aid of an apple hook. The body was later removed to the home of the parents at the Ross Common Hotel. The horse and carriage was pulled from the lake by some of the men of the village, and when the place was visited Thursday by the Times men the horse, carriage and broken harness were still lying on the bank, and to the intense surprise of all, the hat and note book of the young man and two side combs of the dead young lady were found on the shore, having floated to this place. 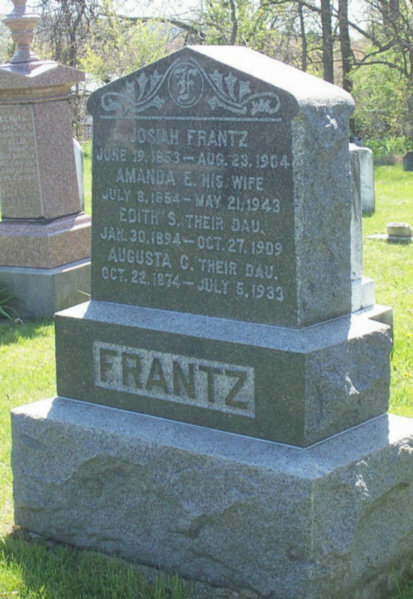 Edith Frantz (b‑Jan 30 1894 d‑Oct 27 1909 aged 15 years 8 months and 27 days was given a religious ceremony at the Zion’s church on route 209 near Brodheadsville (church built in 1862) and buried across the street in the Brodheadsville cemetery. Grave is about 20 feet from roadside near center of the cemetery.